Bloc was founded 9 years after Diesel Cafe. Choos­ing to open a sec­ond store was no easy deci­sion. We knew how chal­leng­ing run­ning one busi­ness was, so the idea of another store seemed daunt­ing enough that for years, the notion seemed to take a back burner. A decade is a long time, to do any­thing. And after nearly ten years, Tucker and Jen were finally ready, for change. Bloc opened its doors on Octo­ber 15, 2007 and expanded spring of 2008 to cre­ate a court­yard for out­door seating! 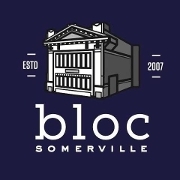 Bloc still boasts a large hand­ful of staff mem­bers from pre-opening and any of its suc­cess is largely due to these solid few that have stuck with us through slow win­ter days and bustling weekends.